Our range of products include marble ganesh statue, durga statue, marble shiva statue, ram darbar marble statue, jesus statue and jesus idol. 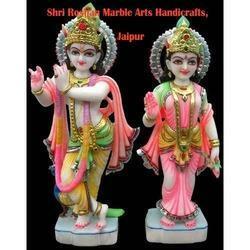 Our company is leaders in manufacturing of marble idols here in Jaipur. 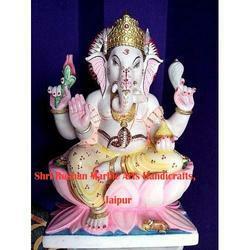 This Marble Ganesh Statue is a perfect example of our skilled labour. Beautifully carved from single makrana marble and beautifully colored which adds to its beauty. We are one of the prominent manufacturers, suppliers & exporters of some best quality marble statues, example Durga Statue & many more. 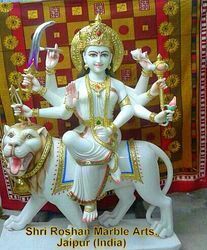 This Durga Statue is made from best quality marble we have made a strong foothold in the market. 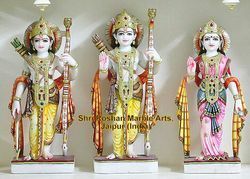 Our statues are already been placed in various famous temples in Vrindawan, Haryana, Delhi, Faridabad, Jaipur etc. Just select the design & finalise the size. Packaging Details: Every idol is nicely wrapped with bubble film and is packed in Wooden crates with foam inside. Since our inception, our team has always in top for providing its customers some spell bounding marble craft. 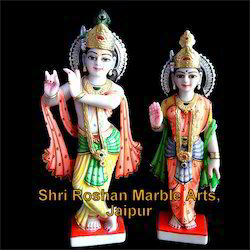 With the same approach we have designed this Ram Darbar Marble Statue. 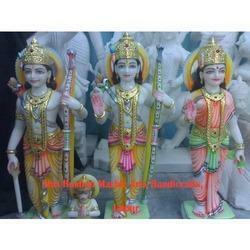 The devinity of this marble Ram Darbar Marble Statue had made our team applauded by every customer. Finished with pure Gold & Silver leaf work on the ornaments of this Ram Darbar Marble Statue, makes it look real. Leveraging upon our rich industry knowledge, we are providing our precious clients a wide array of Jesus Statue. Offered statue is available in a variety of sizes and customized options as per the need of customers. This statue is crafted from high grade stone & modern tools keeping in mind the market trends. This statue is checked on various quality parameters before being dispatched to our customers in order to ensure optimum standards of quality. 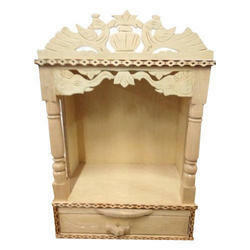 We are leaders in idol/bust manufacturing here in Jaipur & assures the quality of work done. 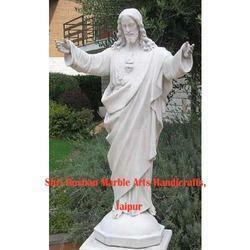 This Marble Jesus Idol is a perfect example and self explanation of our commitment towards our customers. Perfectly carved from a single marble stone giving it a royal & devine look. 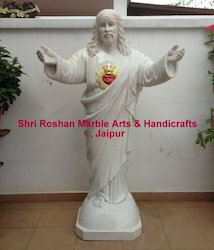 We have already been applaused for this Marble Jesus Idol by our customers from Goa, Singapore etc. Packaging Details: Fully covered with chemically generated foam and packed inside a hard wooden box. We are well known for its artistic carving. 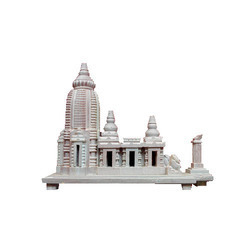 This Beautiful Marble Ram Darbar is a perfect example of art, Highly beautiful and very simple enough. We are well known for its artistic carving. 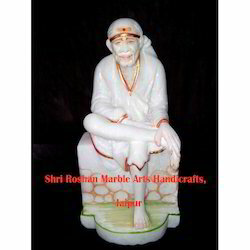 This Beautiful Makrana Marble Sai Baba Statue is a perfect example of art, Highly beautiful and very simple enough. Moulding a stone in a beautiful figure is a challenge for every artist. Thus taking this challenge for granted our team has deigned some beautiful Radha Krishna Statues, with some lovely features. These Radha Krishna Statues are truly a symbol of love & the art gives them a devie look. Beautiful colors gives these Radha Krishna Statues a contrasting look. With the efforts of our expertise, we are able to provide premium quality Buddha Head. These Buddha Head are made from superior quality of raw material which ensure durability at its user end. These Buddha head are available in market at reasonable prices. 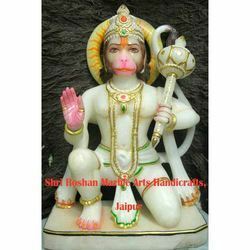 Marble Hanuman Idol In jhiri Marble. Pure Gold work on ornaments though cheap. 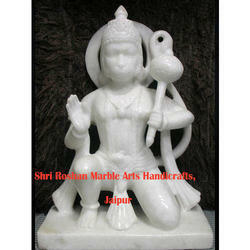 Beautiful White Hanuman Statue in makrana marble. Unique design & no painting done to give it pure look. 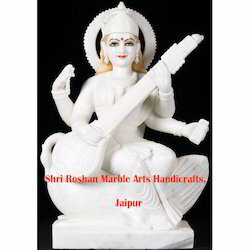 Radha Krishna Statue, Ram darbar, marble stands, marble pillars, marble decorative bowls medallions, fireplaces, fountain, inlay work, wooden jewellery box, Mother Of pearl work, pen stands, chowki ganesh, marble flower vase, polyresin statues, Ganesh statue, marble screen, temple projects, singhasan, marble dust statues, pooja thali, pooja box, inaly table top and all type of sandstone work. 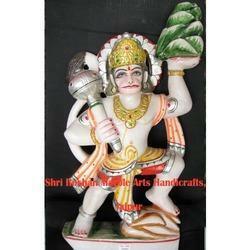 With the efforts of our expertise, we are able to provide premium quality Hanuman Statue. 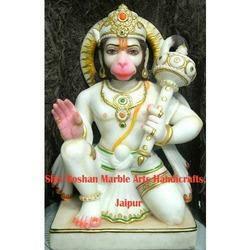 This Hanuman Statue is made from superior quality of raw material (marble here) which ensure durability & its divine look. 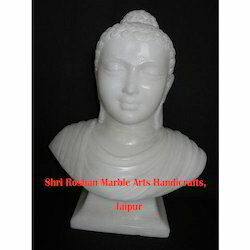 Shri Roshan Marble Arts & Handicrafts is a well known company for it's marble carving work. We offer wide varieties of idols that are fully customizable according to customer's satisfaction. 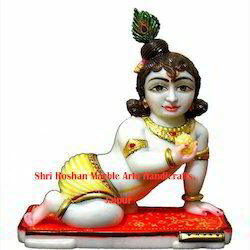 Highly cute Laddu Gopal Statue fully carved from single marble. This laddu gopal statue is a pure symbol of devinity. Converting an odd in something very beautiful is the biggest challenge for an artist. Taking this challenge for granted with our unmatched skilled & extinguish art we are leaders in Jaipur for creating some superb marble arts. This Vishnu Statue in marble is a perfect example of our excellent working hands. Made with pure marble & fully polished give it a devine & vibrant look. With the efforts of our expertise, we are able to provide premium quality Hanuman Idol. This Hanuman Idol is made from superior quality of raw material (marble here) which ensure durability & its devine look. Moulding a stone in a beautiful figure is a challenge for every artist. Thus taking this challenge for granted our team has deigned some beautiful Marble Radha Krishna Statues, with some lovely features. These Marble Radha Krishna Statues are truly a symbol of love & the art gives them a devie look. Beautiful colors gives these Marble Radha Krishna Statues a contrasting look. 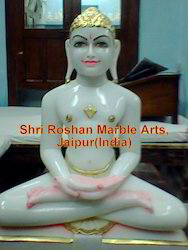 We are one of the leading & trusted manufacturers and exporters of Jain Mahaveer Marble Statue. 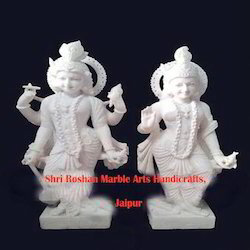 Made from super white makrana marble, these Jain Mahaveer Marble Statues are very beautiful. Since our inception, our team has always in top for providing its customers some spell bounding marble craft. 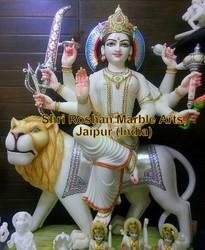 With the same approach we have designed this Durga Marble Statue. The devinity of this Durga Marble Statue had made our team applauded by every customer. Finished with pure Gold & Silver leaf work on the ornaments of this Durga Marble Statue, makes it look real. We are leaders in idol manufacturing here in Jaipur & assures the quality of work done. 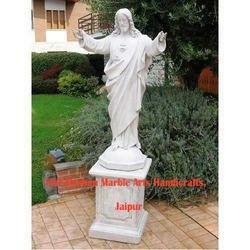 This Marble Jesus Statue is a perfect example of our commitment. Perfectly carved from a single marble stone giving it a royal & devine look. Looking for Religious Statues ?